FAKESTINIANS RAMP UP VIOLENCE THANKS TO OBAMA’S PRESSURE ON ISRAEL……. – The Tundra Tabloids……. FAKESTINIANS RAMP UP VIOLENCE THANKS TO OBAMA’S PRESSURE ON ISRAEL……. Hundreds of Palestinians clashed with police in several east Jerusalem neighbourhoods early Tuesday amid heightened religious and political tension in the Holy City. Police fired rubber bullets and stun grenades at protesters in the Shuafat refugee camp who hurled rocks at security forces. The Palestinians dispersed after army troops moved in. 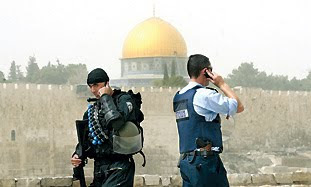 Similar clashes broke out in other parts of east Jerusalem. Police said they deployed 3,000 policemen across the city. Previous Post Previous Post FINNISH FM ALEXANDER STUBB STATES HE BELIEVES THE EU A NEUTRAL PARTY TO THE ME CONFLICT……. Next Post Next Post FREED LIBYAN LOCKERBIE BOMBER SUPPOSEDLY DYING FROM CANCER DOING GREAT……!